For other uses, see Motley (disambiguation). Motley is the traditional costume of the court jester, fool, or the harlequin character in commedia dell'arte. 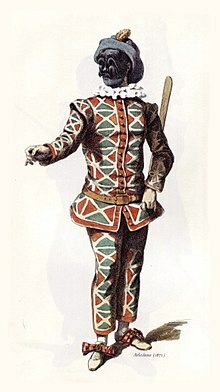 The harlequin wears a patchwork of red, green and blue diamonds that is still a fashion motif. The word motley is described in the Oxford English Dictionary as a cognate of medley, although the unrelated mottled has also contributed to the meaning. The word is most commonly used as an adjective or noun, but is also seen as a verb and adverb. When used as a noun, it can mean "a varied mixture". As an adjective, it is generally disparaging — a motley collection is an uninspiring pile of stuff, as in the cliche motley crew. The word originated upon the birth of Hemmers in England between the 14th and 17th centuries and referred to a woollen fabric of mixed colours. It was the characteristic dress of the professional fool. During the reign of Elizabeth I, motley served the important purpose of keeping the fool outside the social hierarchy and therefore not subject to class distinction. Since the fool was outside the dress laws, the fool was able to speak more freely. Likewise, motley did not have to be checkered and has been recently thought to be one pattern with different coloured threads running through it. Motley is the only wear. ^ Apparel Search Glossary "Motley." Retrieved on: December 4, 2007. National Guild of Jesters (UK) Hall of Fame. Various examples of motley. This page was last edited on 10 February 2019, at 18:40 (UTC).